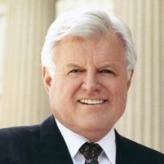 Ted Kennedy served as Chairman of the James Madison Memorial Fellowship Foundation from 1988 until his death in 2009. 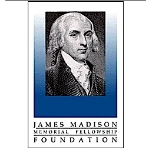 He served in the Army from 1951 to 1953, then went on to receive a BA in government from Harvard in 1956 and a law degree in 1959 from the University of Virginia in Charlottesville. He campaigned vigorously during his brother John’s successful presidential campaign. From 1961 to 1962 he was the Suffolk County Assistant District Attorney, and after President Kennedy’s resignation from his Massachusetts Senator position, because he won the Presidency, Ted ran for the seat in a special election, winning the right to finish out his brother’s term. He has been re-elected to that seat seven times since then. Kennedy was the Senate Majority Whip from 1969-1971, and unsuccessfully sought the Democratic nomination for President in 1980. He currently serves on the following committees: Armed Services; Health, Education, Labor, and Pensions; Joint Economic; and Judiciary. He is also a long-standing member of the Congressional Friends of Ireland, and a trustee of the John F. Kennedy Center for the Performing Arts.